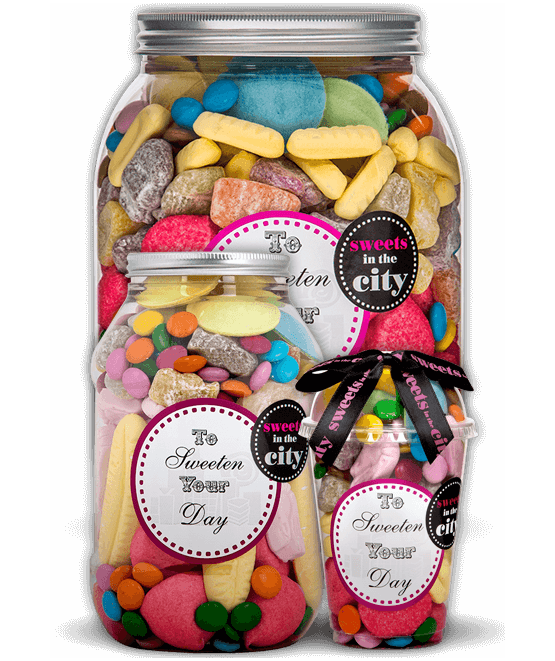 If you need a ‘just because’ gift that will really brighten up someone's day, then look no further than this assortment of yummy sweets! 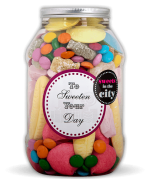 Our To Sweeten Your Day jar is a real rainbow of colours that includes sweet favourites from Foam Bananas to Red Fluffy Frosted Marshmallows and Flying Saucers - this jar really has it all! Guaranteed to put a smile on the recipient’s face and sweeten up your day just as much as theirs, what is there to think about? Sweeten someone’s day today with this fantastic jar of joy! Product 1: Sugar, maize starch, dextrose, acid: E334, acidity regulator, E500, Flavourings, colours: E100, E132, E162. 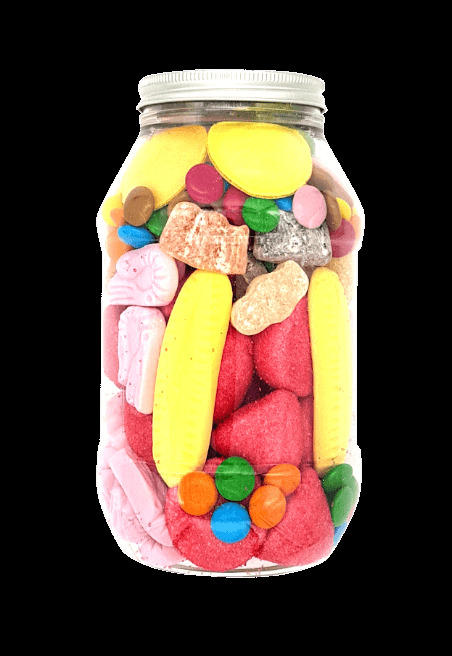 Product 2: Glucose-fructose syrup, sugar, water, beef gelatine, humectants: sorbitol; flavourings, colours: E120, E160c. May also contain MILK. Product 3: Sugar, cocoa butter, dried skimmed MILK, cocoa mass, tapioca starch, dried whey (from MILK), lactose (MILK), MILK fat, colours (titanium dioxide, curcumin, carmines, beetroot red, sulphite ammonia caramel, mixed carotenes, brilliant blue), emulsifier (SOYA lecithin), vanilla flavouring, glazing agent (carnauba wax). Milk chocolate contains: cocoa solids 25% minimum, milk solids 14% minimum. May also contain NUTS, PEANUTS, SESAME SEEDS and SEEDS. Product 4: Sugar, glucose syrup, Water, Dextrose, Beef Gelatine, Maize Starch, Colour, (Beetroot Red), Flavourings. Product 5: Sugar, glucose syrup, water, dextrose, beef gelatine, cornflour, colour (curcumin), flavouring. 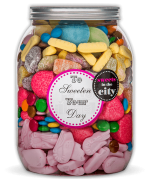 Product 6: Sugar, glucose syrup, water, beef gelatine, cornflour, acid (citric acid), flavourings, colours (anthocyanins, curcumin, paprika extract, chlorophylls), plant concentrates (safflower, spirulina). Great service, great product, speedy delivery! Free personalized label is an excellent touch! Fast delivery, well packaged. 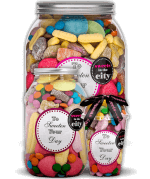 Lovely sweets will order again.